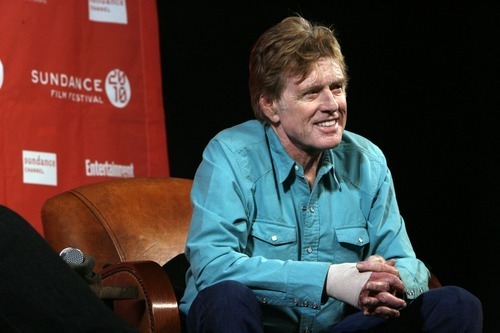 Francisco Kjolseth | The Salt Lake Tribune Robert Redford, seated alongside Sundance Film Festival director John Cooper, answers questions from the media at the start of the 2010 festival. It's always good to watch movie trailers with a dose of skepticism – after all, how many times have movies not lived up to the excitement of the trailer? – but the first trailer for Robert Redford's "The Company You Keep" certainly looks like a thrill ride. The trailer, released Wednesday on YouTube by the Toronto International Film Festival (where the movie will make its North American debut), paints a picture of a riveting political thriller with a huge cast of stars and something important to say. The movie stars Redford (who also directed) as a former Weather Underground radical living a quiet life as a single dad in a small town. But when an ambitious reporter (Shia LaBeouf) gets on his trail, Redford's character has to go on the lam and clear his name. The cast includes four Oscar winners: Redford, Julie Christie, Susan Sarandon and Chris Cooper. It also includes five Oscar nominees: Terrence Howard, Richard Jenkins, Anna Kendrick, Nick Nolte and Stanley Tucci. It also features Sam Elliott, Jackie Evancho, Brendan Gleeson and Brit Marling. Sony Pictures Classics bought up distribution for "The Company You Keep" earlier this week, amid talk that this movie could be Redford's comeback as a director – after box-office disappointments like "The Conspirator" and "Lions for Lambs."